I use all the latest technology in my performances. 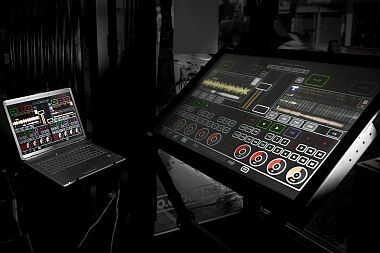 For indoor and evening events, I am the only DJ in my area to use a 40" touchscreen and the newest DJ Emulator software from Smithson Martin. Daytime outdoor events require the use of my Native Instruments Kontrol S4 since the touchscreen is sensative to sunlight. Both setups are powered by the leader in DJ software, Traktor Pro from Native Instruments. These are great companies with first class products. Not every setup has the same demands. I have 7 self-powered speakers from which to choose. Two are 18" woofer units and 5 are high/low/mid range units containing speakers up to 17". To see the DJ Emulator in action CLICK HERE to view. To see the Native Instruments Kontrol S4 in action CLICK HERE to view. Here's a good video on what you can do with the DJ Emulator. To view CLICK HERE.